Ever wish you had the accurate contact data you see in Associationexecs.com in your own CRM? Data licensing gives you unlimited access to the targeted association and nonprofit executives that matter to you. Simply provide us with the criteria you're looking to target and we will build your customized list. You will have unlimited use to that list for 3 years. As a part of the service, we will update your data annually and biannually. There are no frequency limits to the data you license. Additionally, you will also have access to our www.associationexecs.com database. This tool is perfect for prospecting and researching new association/nonprofit executives that can in-turn, become your potential partner. Ever worried that your prospect database is inaccurate and full of holes? We can help! Send us your database of association professionals and we will match it to ours. We will then tell you organizations that are inactive, update contact names, organization stats and even emails. We can even stick our top-notch research team on a scavenger hunt for your hard to find contacts. "Destination Marketing Association International (DMAI) has always maintained a database of meetings and events posted by our members. In order to improve upon the ongoing challenge of providing complete and accurate data which is user-generated, we began licensing select data through a custom integration. In addition, the Columbia Books team provides data hygiene services and we couldn’t be more pleased with the results. Not only have we found the data to be complete but the implementation process was truly a custom solution for our unique needs." Call us at 240-235-0270 or email sales@associationexecs.com to find out more about licensing our association executive data. Looking to reach associations? Need to get your message in the right hands quickly and easily? We can help. With AssociationExecs.com marketing services you will be able to reach the perfect audience, save time and resources, and get a better return on your investment. From custom email lists to design, delivery, and tracking, the team at AssociationExecs.com takes care of it all to ensure a successful email campaign. 1. Build a custom list that you can target by budget, staff size, region and more. 2. Send us your email design or have our professional design team create something for you. 3. Approve your test email and we take care of the rest. AssociationExecs.com is an online database of national, state and regional associations and their top executives. 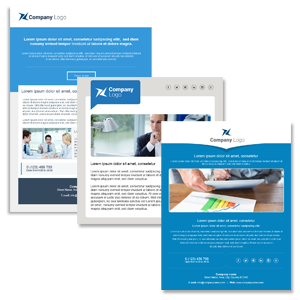 We research key information about your clients so you don’t have to. Information is gathered by our professional researchers, and managed by our team of editors who coordinate and schedule updates year round to maintain a high standard and quality of data. AssociationExecs.com contains a range of association types that must meet strict criteria, including a full time staff and substantial budget size and can be sorted by location, budget size, staff size, individual job titles and much more. Full payment is required prior to email transmission and is non-refundable. All information has been obtained from sources believed to be accurate and reliable but is provided “as is” without warranty of any kind. Columbia Books, Inc. is not responsible for any errors or omissions nor does Columbia Books, Inc. guarantee the accuracy, quality, completeness, currency, or validity of any information contained in the List. If more than five percent of the email list is undeliverable due to a hard bounce, Columbia Books, Inc. agrees to either replace or reimburse the customer for those email addresses. In no event shall customers use the delivery or information for any competitive purpose. We reserve the right to refuse the delivery entirely and terminate this Agreement for any reason, including but not limited to misuse. Columbia Books, Inc. will send the email marketing campaign on the customer’s behalf. The customer may collect email addresses of prospects that respond to the email blast. Most campaigns can be completed in 2-5 days. However, delays in any of the necessary steps—list building, design, and email approval—can negatively affect the project’s timeframe. A report detailing the open and click through rates will be available 48 hours after campaign deployment. Columbia Books, Inc. has the right to refuse sending an email if the content contains inappropriate material or if the offer is not clearly understood. HTML (.html or .htm format): please make sure the images are hosted on your end and your physical postal address is present in the creative copy. Our designers can create an HTML version of your email at a rate of $200/hour. The average time to do so is 1–2 hours. Full payment is required prior to delivery of the List and is non-returnable or non-refundable. All information has been obtained from sources believed to be accurate and reliable but is provided “as is” without warranty of any kind. Columbia Books, Inc. is not responsible for any errors or omissions nor does Columbia Books, Inc. guarantee the accuracy, quality, completeness, currency, or validity of any information contained in the List. In using the List, Licensee agrees not to duplicate, load into other applications, reproduce or copy the List in any form or by any means, not to transfer, sell, loan or otherwise provide the List to any other person or entity except as necessary to carry out the use for which the List is being licensed (to exclusively promote their own services and products). In the event, Columbia Books, Inc. determines that the List has been used additional times beyond those authorized, the Licensee agrees, once notified to immediately cease, and to pay for those additional usages at the same rate charged under the agreement. The Licensee authorizes Columbia Books, Inc. to charge any credit card on file accordingly. Want to get your brand in front of your decision-making execs? 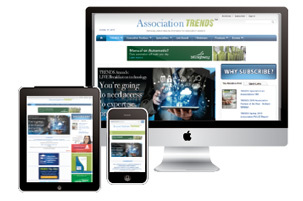 Association TRENDS is one of the most respected brands inside the association community with over 30 years of experience producing award-winning publications, networking events and educational programs. Each year associations spend over $2 billion on goods and services and, with sustained growth, it is an ideal market to sell into. As the Association TRENDS brand continues to expand, we have more options than ever to help you reach your prime customers. This media kit will walk you through all the options TRENDS has to offer from print and online advertising to large scale awards, galas and intimate senior-level educational event sponsorships. No matter what your size, product or service is, we have an option for you. Association TRENDS and its various newsletters, special reports, webinars and live events reach a wide range of association professionals. TRENDS' primary focus is on C-suite level professionals in management and director level positions. Our users are located across the U.S. primarily in medium-to-large-sized associations with 7+ staff members. Over 77% of our customers are responsible for purchasing decisions at their associations and 68% of these associations have budgets in excess of $1 million. Association TRENDS engages over 30,000 executive level leaders in the association community through its live events, print publication, e-newsletters and specialized research reports. These executive leaders are the key decision makers at their associations for finance, technology, communications, membership, meetings and government relations-related partnerships and purchases. Ensure your brand is front and center with these key prospects! 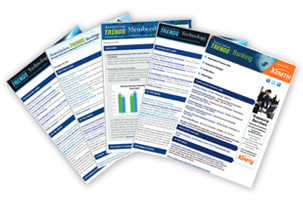 TRENDS is updated online daily, and a weekly paid subscription e-newsletter is delivered directly to each user’s inbox. 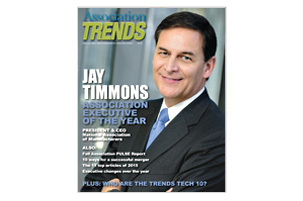 Eight times per year TRENDS publishes a special focus edition in print and online for subscribers and select others in the association community. We offer a wide range of size, layout and issue specific advertising opportunities both in print and online. In addition to these options, we offer several print BONUS issues each year that are distributed at large association industry events. Call us at 240-235-0272 or email sales@associationexecs.com to find out more about advertising opportunities! Or you can download or media kit here. MeetingPlannerLists.com is now a part of AssociationExecs! Welcome! Access not only the most up-to-date records on meeting planners, but also over 125,000 Association Executives, over 20,000 Associations and over 450 Association Management Firms! Increase your market share and brand reach with access to 115,286 decision-making executive contacts at more than 22,114 of the largest national and regional associations with direct phone, mailing and email addresses. 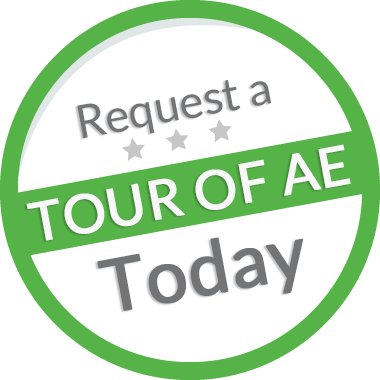 Get easy access to thousands of association executives, their budgets, meeting schedules, staff size and more.